Package for working with JSON. Uses high-speed text parsing, rather than building an intermediate representation as with prior LabVIEW JSON libraries (this is much faster). Allows easy working with "subitems" in JSON format, or one can convert to/from LabVIEW types. 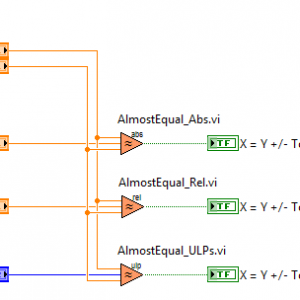 Uses the new "malleable VIs" of LabVIEW 2017 to convert to any LabVIEW type directly. JSON text makes use of a form a JSON Path notation, allowing easy and rapid access to the subitems of interest. Requires LabVIEW 2017 and install by VIPM 2017 or later. 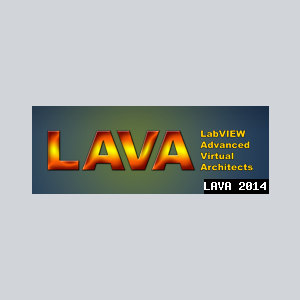 Now on the LabVIEW Tools Network. JSON is a data interchange format (sometimes compared to XML, but simpler). 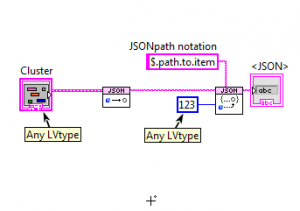 There are multiple projects to create a JSON package for LabVIEW. This is yet another one motivated by this hijacked conversation originally about a different project to convert JSON into LabVIEW Variants. This project uses a set of LVOOP classes to match the recursive structure of JSON, rather than variants. It allows conversation to and from JSON. All functionality is available through two polymorphic VIs: Set and Get. In addition to Get and Set VIs for common data types, one can also convert directly to or from complex clusters via variant-JSON tools. Copyright 2012-2016 James David Powell, Shaun Rumbell, Ton Plomp and James McNally. LV-muParser provides a simple LabVIEW API for muParser fast math expression parser. A modified version of muParser v2.2.5 is included. 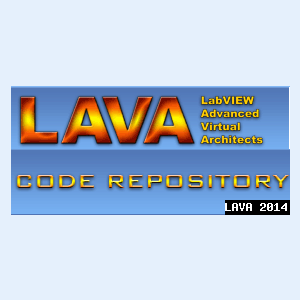 It will be installed to your "<LabVIEW>\resource" directory. I have added support for the "!" (not) operator as well as added ":" as a valid character for variable names. You will find the muParser API in the functions palette under "Addons > LAVA > muParser"
The Threshold Hysteresis VI allows an input (for example, a sensor) to drift out of an inner limit without generating an invalid flag, but if it drifts outside an outer limit it then becomes invalid. For the reverse, when the input crosses back into the outer limit it remains invalid until the value falls inside the inner limit. For simplicity, only one input parameter is provided for both the inner & outer limits, and is negated for the lower limit, as generally tolerance limits are equidistant from the nominal. Description: This is simple try to create analog clock. Version History: v1.0.0: Initial release of the code. See link for a full description of the license. 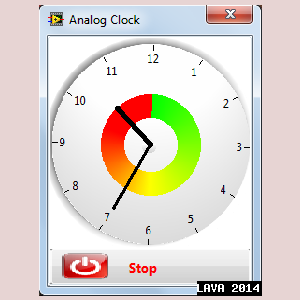 search for the "Analog Clock_LV2010" support page. 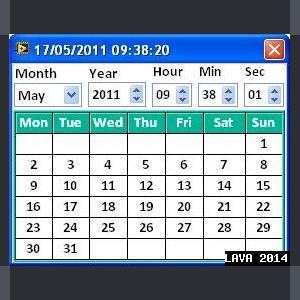 This Calendar is developed for the report generation. This tool is very useful in report generation to pick up the date. Please give me suggestion for this to improve more. ODE Manual.pdf - The original guide to the ODE. At least brief knowledge of it is necessary to understand the main concepts and mechanisms of library. Due to the use of the same terminology, it can also be a sufficient source to use the lvODE. The main difference from the original is the simplified naming convention. lvODE Class Hierarchy.pdf - graphical representation of a lvODE class hierarchy of classes library - not necessary to start programming, but it may help to understand certain concepts. lvODE Function Reference.pdf - a list of all public lvODE functions with descriptions and organized by class. Descriptions of the functions derive much of the original ODE manual, however, cover all the differences of the conventions and LabVIEW specifics. This document is definitely to be polished (better grouping, more detailed descriptions of each section, etc.) Files *. png - map of all pallets An integral part of the documentation are also descriptions in of context help for each VI. In large part they fit the descriptions in the file "lvODE Function Reference". Private functions are documented as well. lvODE is not a finished project. Once the ODE itself is still being developed, second, not whole its functionality is currently implemented in lvODE. The major differences include: no support for trimesh, heighfield and convex geometries, the lack of a 2D Plane constraint, lack of gyroscopic mode for the bodies, single precision floating point numbers only. Few words about licensing. I publish lvODE under such a restrictive license (see below), because this is still experimental phase. I’ll appreciate any feedback which could help to make this library better and more stable. My further plans are to provide less restrictive free version and full-featured commercial one. Please contact me if you are interested. Comments on this approach are also appreciated. v0.1.0: Initial release of the code. search for the "lvODE" support page. This class is used to generate a single summary document for any folder containing LabVIEW elements (controls, VIs, projects, classes, or libraries (lvlib)). It recursively traverses the folder structure and reads the documentation from all VIs (including custom controls) and the documentation attached to all front panel controls. The class uses that information to build a document in HTML, RTF (rich text), or plain text (ASCII) formats. HTML is the preferred format, since this is the only format that includes lvclass descriptions and also supports the creation of a hyperlinked table of contents (TOC). The UI.vi is an interactive interface for creating documents. The Generate.vi provides an API if the user wants to programatically call this utility. They can be found in the Public->Methods virtual folder. Any documentation read from the source elements (VIs, controls, projects, etc.) is treated as pure text. There is currently no provision for escaping characters that might be interpreted as control characters in HTML. 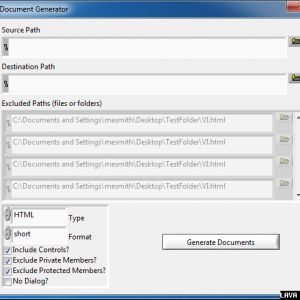 search for the "Document Generator" support page. Waptia is general genetic optimization algorithm - it tries to maximize user supplied function of N variables (so called "Fitness Function"). Function is given as strictly typed VI reference. So the optimization goal may be described as: find such set of N numbers for which Fitness Function value is highest. Pikaia name comes from lancelet-like creature which lived ages ago in Cambrian sea and waptia was another Cambrian being. Original Pikaia was developed for educational purposes, but it grew up and became widely used routine. 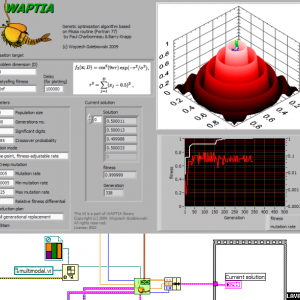 Waptia is almost 1:1 conversion of Pikaia code (which is public domain) to LabVIEW - parts of original Fortran code are placed in related VIs - with some cosmetic modifications and improvements. Although Waptia already does real job I treat this code as starting point for further development to create sophisticated, but still easy to use genetic algorithm. Usage is very simple - just put Waptia.vi on block diagram and provide number of independent variables and fitness function VI reference (which may be created using included template). There is of course a lot of parameters to tune, but default set usually does good job. Alternatively extract ZIP to User.lib. There are no external dependencies. Documentation is provided in "Waptia docs.rtf" file. It's just a description of all controls of Waptia.vi with some background information. Same information may be found in context help. Information on how to write your own fitness function is provided as comments in "Fitness Function Template.vit"
If you want to understand how Waptia works, whole code is extensively commented. There is one quite complex example (but I hope that still understandable) located in _examples folder - "multimodal optimise.vi"
If you want any support on general or specifically genetic optimization problems, just contact me. 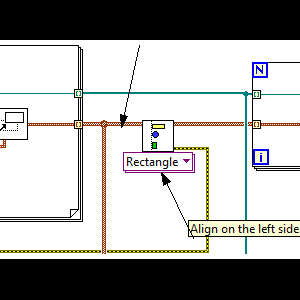 A set of VIs to align or distribute a set of points or objects, they behave similar to the align and distribute functions in the LabVIEW IDE. These tools are usefull when dealing with objects that needs to be rearranged. - 0000021: [bug] The palette shows Align Distribute.vi as name. v1.1.0: Initial public release of the code. This product includes software developed by the . search for the "Distribute objects" support page. An eclectic set of wrapper VIs around some windows API functions. I wrote these many years ago (1998? wow!) but have used them to some extent in virtually all my windows programs. I've included all the original functions (accidentally re-compiled under LV 9.0) and just wrapped them up in a project and added the LAVA required stuff so your getting them "warts 'n all". 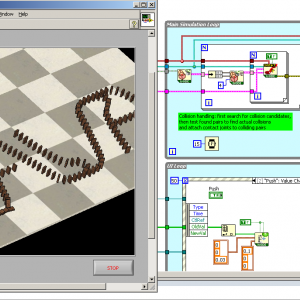 Many functions have been superseded by LabView functions and I expect many people already have their own. But there are still some gems I couldn't do without and maybe someone will find them useful. Unzip to a directory of your choice. 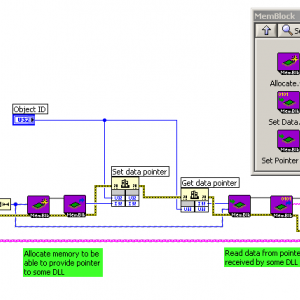 MemBlock is easy to use interface for internal LabVIEW memory manager functions (namely AZNewPtr, AZDisposePtr and MoveBlock from LabVIEW.dll). It allows for convenient work with continuous nonreallocatable blocks of memory) - allocating and dealocating blocks and write and read data to and from them. It is usable everywhere you deal with external DLL and you have to provide pointer to some data or read data from received pointer. Typical usage case is dealing with complex C structs containing pointers to arrays or strings. Preferred way to install library is to use VIP package and VI Package Manager. Alternatively library may be used after unpacking it anywhere on disk. However, it is most convenient to copy entire MemBlock directory to the directory \user.lib. After refreshing palletes (or LV restart), in the User Libraries, sub-palette "MemBlock" will appear. 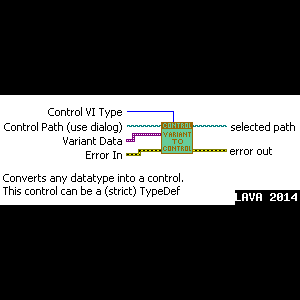 Descriptions of all VIs are available through the LabVIEW context help. search for the "MemBlock" support page. 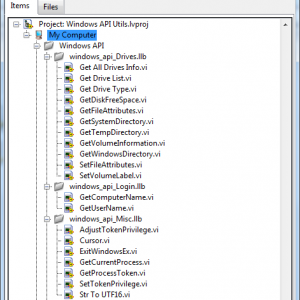 This VI logs an Application event associated with "error" to the Windows Event Viewer (eventvwr.exe). An event description includes the "error" source and code along with the leading "reason". This information can be viewed by opening an Event Properties window in the Event Viewer. 1.0.1: Bug Fix - Removed increment in "Convert Unicode to ASCII.vi"
1.0.0: Initial release of the code. The watermark is buried in the space characters of your text ! It is "not" possible to find the watermark in the text only if you know where to look. How things work you can see in the attached example_watermark file. The file Spacy_watermark.vi is the packer and recovery of the watermark text inside a text string. Copy the watermarked text inside a document (.doc, .txt, .html) so this text is tagged with your watermark of choice. Explore how its done...... and let me know if you like it ! Array of strings to an enum. A simple set of Sub-VIs to efficiently implement text-to-speech in LabVIEW applications on Windows using the Microsoft Speech API (SAPI). Updated SAPI Speak SubVI: SAPI Speak is now polymorphic, accepting either a text string or a file path (which should point to a text file containing text to speak). In addition, SAPI Speak now handles speech flags correctly thanks to code contributed by LAVA user 'jdunham' included in this release. THE APPLICATION CONTROLS A SIMULATED RAILROAD INTERLOCKING CONSISTING OF PASSENGER STATION TRACKS, A GRADE CROSSING BETWEEN TWO RAILROADS AND A RAILROAD SWING BRIDGE. All switches and track signals are controlled for the purpose of safely lining one train movement through interlocking at a time. Simulated occupancy of each track section by a train movement is displayed. 1. Line a selected track switch for movement into or out of the passenger station siding tracks. 2. Line one of five preconfigured interlocking configurations (eastbound, westbound, northbound, southbound or Stop), in preparation for a simulated movement in the same direction (movement will wait outside interlocking limits if configuration at Stop). 3. Select a movement direction and initiate a simulated train movement through interlocking. A simulated movement (begun by clicking on the Initiate button) will not proceed completely through the interlocking unless the latter is configured for the same direction as the direction of movement. Such a movement may progress partway until it encounters a red signal and will then stop. It may be restarted by first lining the interlocking for the proper direction and then clicking on Initiate again. Track signal indications will update in real-time to reflect occupancy condition (unless overriden by current interlocking configuration). The indicator for an occupied track section appears orange, otherwise green. Each signal indicates PROCEED (green) or STOP (red). One or more signals will be forced to display STOP as part of a preconfigured interlocking movement direction (irrespective of track occupancy). The application uses a Producer-Consumer (Events) design pattern. The interlocking function requests are handled by the producer loop, with separate consumer loops for lining a siding switch, configuring an interlocking direction and initiating a simulated train movement. A separate display loop executes in parallel. Separate queues are used to pass operator requests for lining a track switch, configuring an interlocking direction and selecting a direction for simulated train movement, using a different enum typedef for each. State machine design patterns are used within the track switch lining, interlocking configuration and interlocking movement subVIs. Four functional global variables are used for all state data involving track occupancy, switch and bridge states, signal override states (the latter used for lining a given interlocking direction) and current relative movement location/movement direction. The display loop is initialized by a notifier at the beginning of application execution and runs in parallel to continuously update track occupancy display along with switch and bridge states and all signal indications reflecting interlocking conditions. SubVIs are used in the display loop to read the binary state word supplied by the functional global variables associated with the track occupancy states, switch/bridge position states and signal override states. --see readme file for contact informaation. This VI computes the Leventshein distance between two strings. insertion, deletion, or substitution of a single character." indicating how many steps (insertions, deletions, character substitutions) are required. These files allow the programmer to maintain a fixed-sized representative sample of data, regardless of how many data sets are accumulated. The storage may be in the form of a shift register (a.k.a. VI Global) - VIG_self_decimating.vi performs this job - or in the form of a binary file on disk - VIG_decimation_indices.vi and write_2Ddbl_decim8_REentrant.vi do that job, with help from decimatd_evenly_spaced_2D_DBL.vi and decimated_cleanup_2D_DBL.vi. Note that the given VIs are intended for storing 2D DBL arrays, but it is straightforward to modify them to do other formats such as 1D i32 arrays. Works on any N-dimensional array regardless of visibility of caption, label, index display, or scrollbars. Designed to be used on mouse events that provide the mouse coordinates. Limitations: Property nodes do not indicate the array border width, nor if the user has chosen to display an element gap. These inputs are thus provided on the VI. Conway's Game of Life is a fun little simulation of a group of cells. How new cells are born and how old cells die is decided by a simple set of rules, but can lead to complicated behavior by the entire colony. 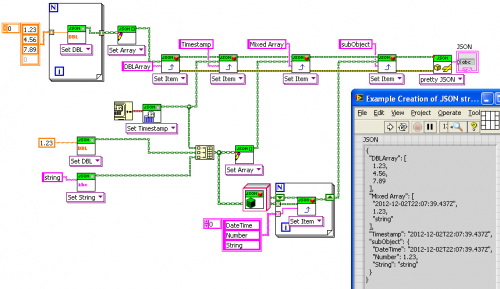 I've always found this simulation to be interesting and I thought coding it in LabVIEW would be a fun exercise. Comments and critiques of either the game or of my coding style are always welcome. 1. A cell that has one or zero neighbors dies of lonliness. 2. A cell that has four or more neighbors dies of overcrowding. 3. An empty cell that has exactly three neighbors containes a new cell in the following generation. A thorough explanation of the Game can be found at http://web.archive.o...7s_game_of_life . This uses the OpenG time, file, and variantconfig libraries. They are not included. 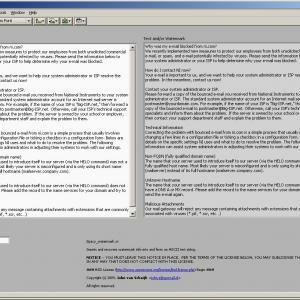 1.0.1: Include readme.txt in the zip file. 1.1.0: Added Open and Save As functions (in the menubar). Added an About dialog. Removed the Exit button (redundant to Close). 1.1.1: Forgot to include the .rtm file in the distribution. Rows/columns now update when opening a .gol file. This Vi was made so that you can easily view and create environment variables from within Windows XP. Also for added safty it will check the name you are trying to use, and won't allow its creation if a variable with that name already exists. To use this VI you need to be using Labview version 8.20. With Labview 8.20 installed open the VariableReadWrite.vi file, then click run. While it's running open the View Variables tab and click "Refresh Variables" to view all your command prompt variables. Two String arrays are created, the Name of the variables, and their values. A text window is also displaying what the user would see if they typed "set" at a command prompt. To create a variable open the Create Variables tab and fill in the information for Variable Name and Variable Value; then click Create Variable. Please note that you may need to log off then back on for the new variable to take effect. If needed there is a "Run Regedit" button which will open the registry. From here you can see the newly created variables in the location mentioned in the Features section. When you are done click stop to end the program. Lists the paths of all VIs in memory other than itself, with the (optional) exception of vi.lib VIs. Note that if you do not exclude vi.lib, some of this VI's subVIs will appear on the list. Prompts user to save the list to a text file or to Cancel the save operation. This VI might be useful to those who do not use a rigorous source code control scheme, but still want to keep track of many VIs.